You’ll need a scanner and a shredder. There are many options for finding an appropriate scanner—some people prefer a large size scanner that they can feed documents to, and some might opt to use their smartphones. Either way, a little online search can help you find the best option. A shredder can be useful for destroying the document after it’s been scanned so that your important personal data doesn’t fall into the wrong hands. There are plenty of these on the market and you shouldn’t have trouble finding one that suits you. Alternatively, some retailers offer shredding services, if you choose to wait and outsource this task. Once you’ve scanned your papers, you need a logical way to set up and store them digitally. You can either do this on your own or find software that will automate the task for you. If you choose to manually take on the job, you likely want to set up folders and sub-folders much like the way you had the documents organized when they were in paper form. For example, you can have a folder named “Taxes,” with subfolders containing year names, such as “2016.” Each subfolder can once again contain subfolders, such as “Expenses.” Software programs, like Hazel, can take care of the organizing for you. Do a bit of research to see which software will work with your platform. Do you want to store your folders on your computer? Or would you prefer to have them stored on a cloud—like dropbox or carbonite—where you can access them from anywhere? No matter the option, think of security. If on your computer, find ways to add appropriate protection, such as adding a passcode to your documents. You might want to think of a backup system as well—this can be another online server or a hard drive. This way, should something go wrong in one place, you’ll have a retrieval option elsewhere. 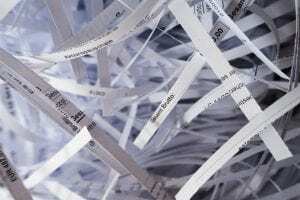 Once your documents are digitized and backed up, you can safely start shredding them. Make sure your shredder is set to cross cutting, which is a better in terms of security. Then enjoy the extra space in your cabinets and drawers! 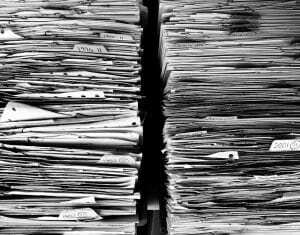 Digitizing personal paperwork can often be tackled on your own, but if you own a large business or organization, the thought of digitizing your company’s paperwork can be an overwhelming task. Which is why you might want to consider using a service like GRM Document Management. GMR provides exceptional services in document management solutions, software and more. From scanning and saving paperwork to shredding hard copies, they’re a one-stop shop in ushering your organization into the future of paperless transactions. If you decide you want to save your hard copies, but don’t have the space to store them, check out the safe, clean and affordable units available at Moishe’s Self Storage. We can accommodate every size client, whether you want to store past tax returns or entire inventories of a commercial chain; whatever you need to store, Moishe’s can handle it. And with convenient storage facilities located in Queens and The Bronx, retrieving your items is a breeze. Contact us today to speak to our storage personnel.